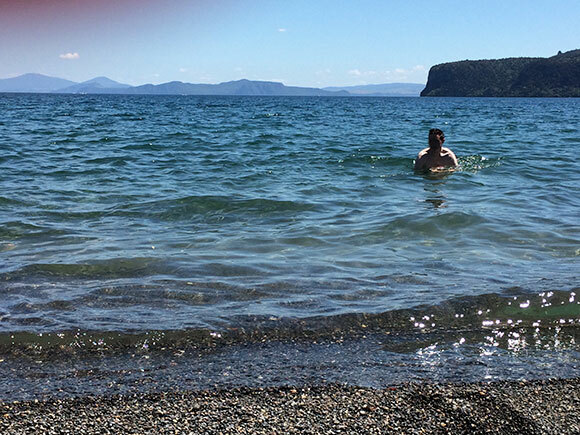 Lake Taupo is a volcanic caldera in the centre of the North Island, filled with freshwater by the Waitahanui, Tongariro and Tauranga Taupo rivers. It's very, very pretty. 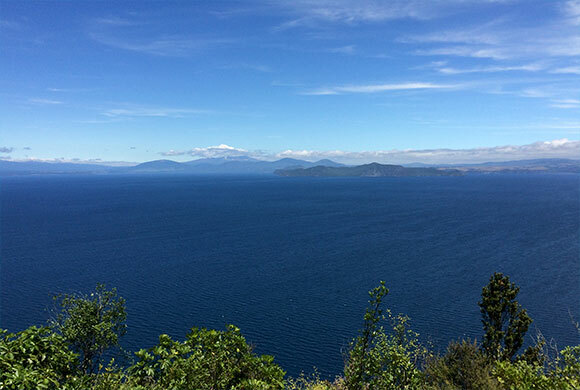 Road cyclists converge on it every November for the 160km Lake Taupo Challenge, round the lake. Three years ago, amid great fanfare, the Great Lake Trail was launched, a collection of separate off-road trails on the lake's coastline and adjoining river valleys. A cursory look at the map shows the main problem; although this is marketed as The Great Lake trail, it's actually two trails, a long distance apart; the 30km western section is particularly problematic as it starts from an isolated road, requiring a long (=expensive) shuttle ride, or a very long ride on the road, and finishes in a remote bay from which you need a boat transfer across the lake (or, you can just turn around and ride back again). 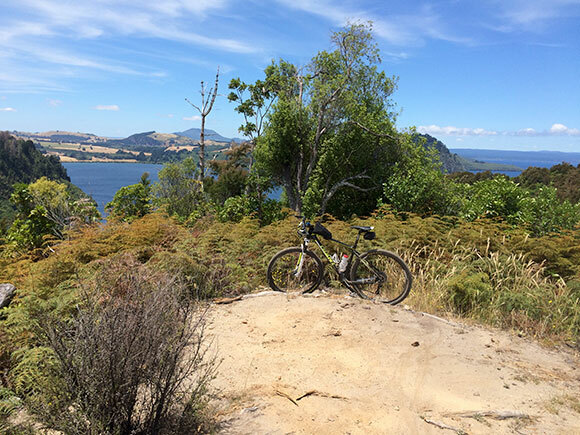 There's no way to connect the sections of the trail by bike without a 35km ride each way on the road, and to do that you need to do the Waihaha to Waihora bay section as a there and back ride, making it around 130km from Kinloch, which is a monster day on a mountain bike. The western trail starts from a carpark on the Western Bay road (state highway 32). The trailhead is at [-38.791565, 175.693437]. The trail follows the river valley down to the western shore of Lake Taupo, then turns north to Waihora Bay. The upper part of the track through the gorge track is very pretty; the lower part follows Taupo's tortuous coast. It doesn't seem to prioritise either a direct line or retaining gained altitude, rather it just dives into and around every gully and back up the other side. The whole trail is covered in some sort of fine pumice dust, so clean & lube your bike thoroughly after this ride. Waihora Bay, like many of the nice little bays on Taupo's shore, is infested with boaties. The bay is a tiny spit of sand; the day I went, there were 6 boats, with, kids, dogs, etc, and the water smelled faintly of diesel. This bay needs to be cleared of non-shuttle boat traffic if they're going to use it as a trailhead; it's not big enough to be both. That's on the one hand. On the other hand, the views from the (many, many) summits are spectacular, amazing vistas over one of New Zealand's most beautiful spots. The hassle of getting there, and the slightly aimless nature of the track itself, are worth it, just for the views of this stunning place. The somewhat confusing marketing of the Great Lake trail promotes the northern section as four separate trails, all with names like K2KWKKW2, WWK2W, etc. Dodo looked at a map and decided to do it as one continuous ride, starting from another remote carpark at Orakau stream on Whangamata Road. The trail descends to the lake shore on Kawakawa Bay, then climbs over the headland into Kinloch, a charming little town with a good cafe. From there the trail climbs over the next headland to the wide, shingly Whakaipo Bay, where it finishes. On the way over the headland, a separate track (just called Headland) offers a 9km loop with gorgeous views over the lake. You can do this as part of one big ride, or ride it from Kinloch as a short morning or afternoon ride. Again, the actual trail is strangely bland... sort of anodine, a sensation I found strange. Like riding through a holiday brochure. It's mostly covered in the same pumice dust as the western trail, which means you can do massive powerslides round the corners if you can find a bit with a long enough run up. Again, Whakaipo Bay is nowhere in particular, and extremely pretty - an excellent spot for a swim. This time it's much easier to get out though; just ride up the hill to Mapara Road and turn right; Acacia Bay is about 10km away to the east. Having a spare day in Taupo, Dodo decided to tackle the Huka Falls trail, together with the track up to Aratiatia dam. 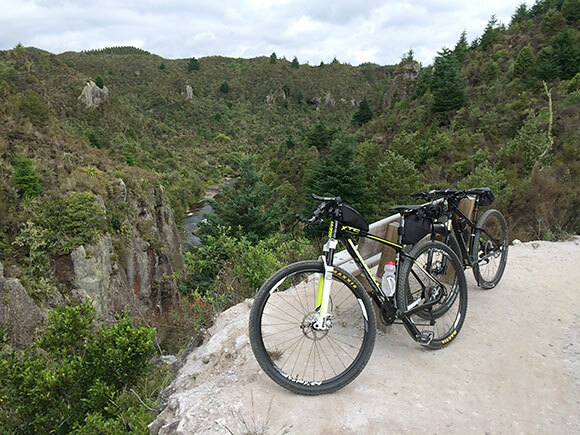 This turned out to be the best ride of the trip, mostly on mature trail and back roads along the Waikato river. The Huka trail heads out of town from the old highway bridge over the Waikato (Tongariro Street) and follows the river for 2km before climbing up to Spa Road - turn left shortly after onto County Avenue into the thermal park and follow signs for the MTB trail. This is another one of these unnecessarily twisty-up-and-downy efforts through a sort of pumice bowl, but on existing the other side you're onto a lovely track up the east bank of the Waikato as far as the Taupo bypass bridge - a brief, stiff climb up the hill to your right, and you're on another peachy trail. After some lovely riding on a narrow trail through meadows on the east bank of the Waikato, you'll arrive at Aratiatia dam. Cross over and follow the mapped route along backroads and forest trails (mostly signposted) to the Thermal Explorer Highway and Huka Falls. After that jump over the bridge and climb the trail to retrace your route back to Taupo. The promotional material for the Great Lake Trail glosses over the disjointed experience of riding the trails; and the hassle and/or expense of transporting yourself and your equipment around or over the lake. The reason is never actually explained, but it's an access issue with a recalcitrant landowner. Not an uncommon problem with changing land use in New Zealand and more recreational access to the countryside. Perhaps we shall reign in our out-of-control agriculture sector eventually.. in the meantime, these trails (possibly with the exception of the western trail) are still worth a visit just for the superb views, and the general excellence of a holiday in Taupo. But the peach is still the ride from Huka Falls to Aratiatia dam and back.